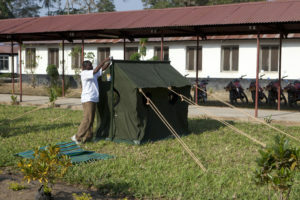 The Entomological quality assurance (EQA) project offers technical support and supervision to the Tanzania National Malaria Control Program (NMCP), which implements nationwide entomological surveillance in 62 councils through community based mosquito collectors under direct supervison of the district level authorities. Routine community-based adult mosquito surveillance is done in different sentinel sites (villages) of the surveillance councils. The primary mosquito collection within each sentinel site (village) is done at three selected households by the recruited volunteers under immediate supervision of the council malaria vector surveillance officers (CMVSO). As a first phase of this programmatic implementation, EQA surveys run in 28 councils supported by the Global Fund (GF) through the independent funding by PMI. Mosquitoes are collected using CDC light traps indoors to establish densities of host seeking mosquitoes, as well as bucket traps indoors and outdoors to measure mosquito resting densities. This pilot national scale survey will be one of the largest and most comprehensive entomological surveillance systems in sub-Saharan Africa, and will provide quality information directly on mosquito abundance trends, biting behaviours, species composition and transmission intensity across the country. The well established surveillance system will be triangulated with other existing surveillance platforms and inform the NMCP and partners the progress with malaria disease burden specifically malaria transmission.